Food can be nostalgia inducing. Very much so. Sometimes people stop eating their favorite foods when an unpleasant experience gets attached with it. Even when the most pleasant memories are attached with a particular food you can feel like not having it again as the memories it brings can be pain inducing. This mung ka cheela has been one such recipe. A cheela is a savory crepe to make you acquainted with this term. A couple of weeks back I was at a wedding party (In Lucknow) and mung ka cheela was being served as a part of a huge range of appetizers. I told an Oriya friend of mine to take her kids to that counter as kids like it very much. They were tasting mung ka cheela for the first time and this friend was intrigued enough to ask me how did I know that her kids would love it more than the other fancier and exotic looking things around. I chuckled in my mind. The reason why I knew it was, Mithi loved it too. I remembered the time when other kids used to play with Mithi and this mung ka cheela used to be a hot favorite with all of them whenever they were together in my home. Probably it is the mildly favored slightly chewy nature of this cheela that kids find great to munch on, not that we adults find it like baby food. It is a great breakfast dish but more popular as an appetizer in wedding parties I guess. The rolled up cheela sliced in 2 - 3 small portions seems to be very popular as I have witnessed. I am talking about the wedding parties in UP . So I didn't make this particular cheela for a long time. Some 8 years to be precise, the time since Mithi stopped taking solid food. And I never felt like cooking her favorite foods ever again. When I saw these small kids enjoying this cheela I realy felt good and when we came back home I soaked mung daal and made cheelas with freshly made paneer. Nostalgic I was but in a good way. Now that her proud momma has learned to remember her good healthy days with a smile the nostalgia is good. The cheela feels complex by it's looks but actually gets ready within 30 minutes at leisurely pace...when you start from soaked mung daal and cold skimmed milk from the fridge ...enjoying the process while making it. Heat the milk in a saucepan and grind the soaked mung daal while the milk comes to boiling temperature. 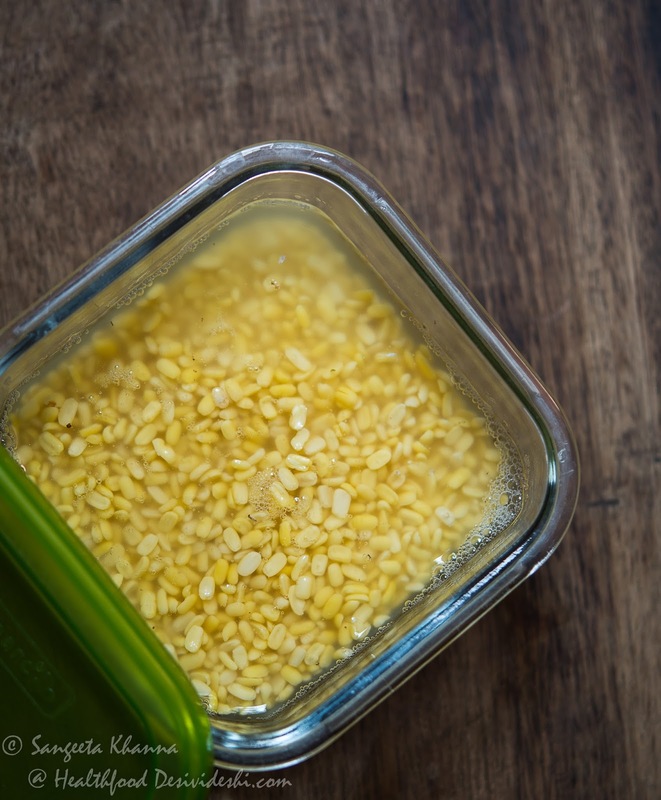 Mung daal paste is quick to make as the daal is quite soft. Add salt to taste and turmeric if using, adjust consistency to make thin pancakes or crepes. Add the vinegar or lemon juice as soon as the milk reaches boiling temperature. Slowly adding the curdling agent helps in getting softer paneer or chhenna as it is called in some parts of UP. Strain the curdled milk as soon as you see the clear whey separating from the curdled milk.The solid part is panner also called cottage cheese. The whey can be used to knead chapati dough . Add chopped onions, green chillies, salt and pepper to the paneer and mash to make a soft crumbly mixture . Make thin crepes on hot griddle using very little ghee, it is usually cooked on one side as mung daal cooks quickly. Other side can be cooked if you feel like. 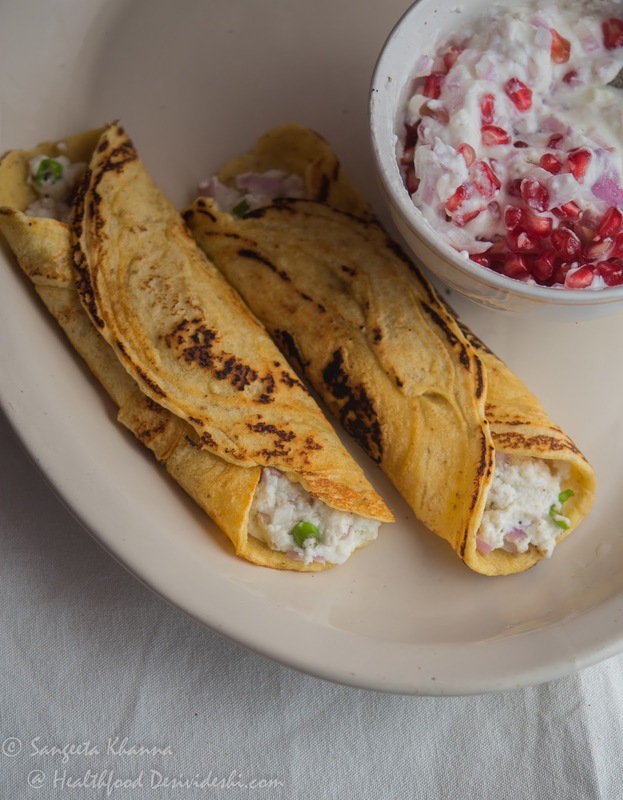 Spread the mixture over the crepe then fold the sides overlapping each other, pressing to flatten the rolled up cheela so the paneer stuffing sticks well to the moist inner layer of cheela. Serve hot with any chutney of your choice, it can be served with a raita of your choice if you are having it for a meal. A green coriander chutney goes well with it when it is served as a snack. The cheela can be roasted deep brown or light brown. The browning has little difference on the final taste, browned ones are crispier though. But both get soft when cool and taste equally good at room temperature too and that makes it a good tiffin box option too. Those who are avoiding or minimizing carbohydrates in their diet will find this recipe great. Note : some readers have indicated that this mung ka cheela could be similar to Andhra pesarettu. I have posted pesarttu earlier. The only similarity between this cheela (crepe) and pesarettu is the ingredient mung daal but the similarity ends there. This is an interesting example of how an ingredient behaves differently in it's different forms. In pesarettu the mung daal used is with skin and the texture and taste of the dosa is very different. Here the husked mung results into a mild flavor and an almost glutinous texture. I have indicated that the roll sticks by itself and stays in shape, that is because if the slightly sticky nature of the mung crepe here. The flavor of the yellow mung is so delicate that another version of mung ka cheela , which includes some seasoning in the batter, tastes very different from this one. 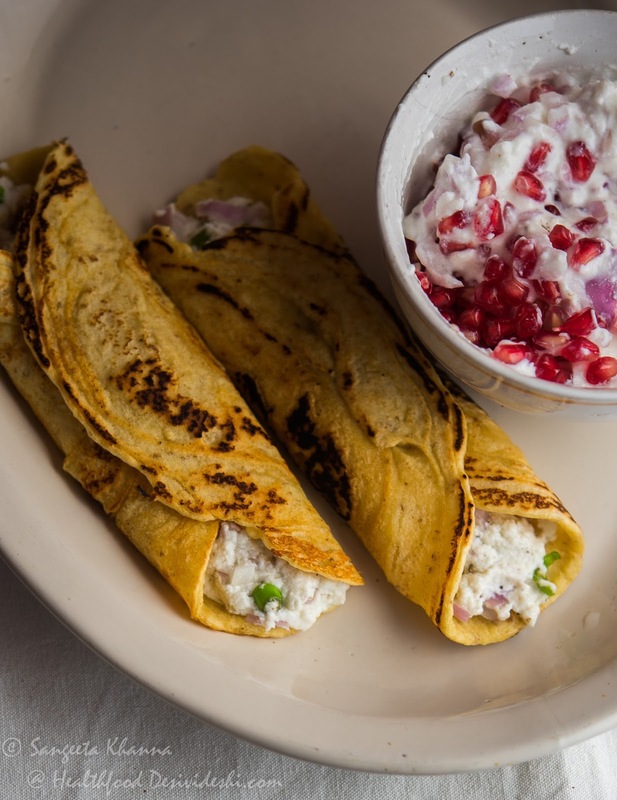 sounds very much like the andhra pesarattu :)..the filling looks yum! I wish you could make me breakfast, or dinner, or lunch. Thanks for sharing your words of comfort, sis. Thanks Priya , do let me know if you like it. @ Sudha...it is not like the pesarettu in any way . I have added a note to the end of the recipe to explain that. Thanks for indicating that. @ Cynthia...thank you sis. Your words made me smile. @ Suparna...thanks darling . Yes i know i have immense inner strength , but this is like a learning process . The more you feel week the more you equip yourself with the virtue called strength . Thanks for the sweet words. - Yours truly, you know who :). Moong dal cheela will always remain special for me now. Loved the simple and easy to make recipe. And LOL @ wishing Shakespeare was a foodie :) But why could he not say, "Moong Dal cheela with any other name will taste as great" :) ? I couldn't stop myself from making this "yellow roll with white filling" with green puckered leaves and green zig-zag leaves (coriander) for breakfast today, and we loved it... Paneer was also homemade, and other paneer (including amul) doesn't come anywhere close to it.... And,making paneer at home was easy too, thanks to your tips :). Btw, just remembered that had seen a similar stuffed cheela recipe on Sanjeev Kapoor show with the same filling, but the cheela was made of sprouted green moong..... Am sure that must be inspired from this recipe, as Sanjeev Kapoor was in Banaras aka Varanasi for some time in early years of his career :). Yes Anonymous...homemade paneer lifts up anything it is used in. I am so glad that you made this cheela and it brought to you sweet memories of Mithi. You have a strong desire to be strong and an even more intense desire to be able to remember Mithi with a smile. And I am watching you going from strength to strength. Mung daal soaks easily and 2 hrs time is enough . Soaking overnight works nicely too as this was done back home. Later on i observed that 2 hrs time is enough. @ Bakingdevils ...Thank you and welcome to Banaras ka khana . These are very simple to make , actually the time taken to make a besan batter is equal tot he time taken to make mung paste in the mixie ...so take my word for the ease factor. Do let me know when you try this. sangeeta... ur such a strong woman makes me proud to know you, what a lovely way to keep ur daughter with you always by remembering her favourite foods, we mothers like that dont we? i have never made chillas ever (only the green south indian version) and now i will and wl let you know how nayantara liked it. Time heals all wounds. And I sincerely hope Mithi is in a better place smiling as we recreate her favourite dish in our kitchens and our minds. Are you familiar with The Book of Job in the Old Testament. The Bible is the ultimate book of strength and we hindus should not miss out on it. Thanks for the sweet words Aparna. Yes time does heal. 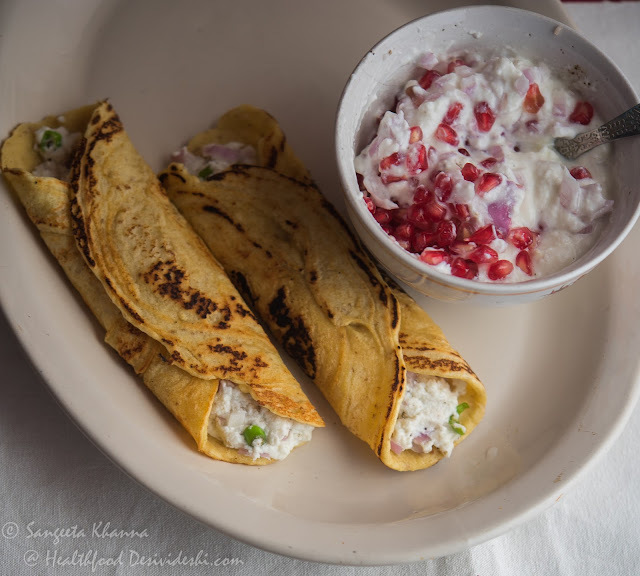 Thanks for sharing this recipe,Sangeeta! The girls will love it. There is the mung sprouts and tofu stuffed mung ka cheela on healthfooddesivideshi.com but you can use even alu ka chokha or some soya keema kind of thing if you wish.